In reply to Charlie's comment on the post below, here are a couple more tasty poster sites from stateside. The first is Patent Pending Industries, who have a fine selection of rather beautiful prints, and are based in Seattle, which the older members of our readership may remember was once the centre of the world. That's their poster for Air above left, and they do stuff for Nick Cave, the Decemberists, Belle & Sebastian and a host of others. ...a year-long collaborative project with the band producing a unique silkscreened poster to promote and commemorate each live performance. 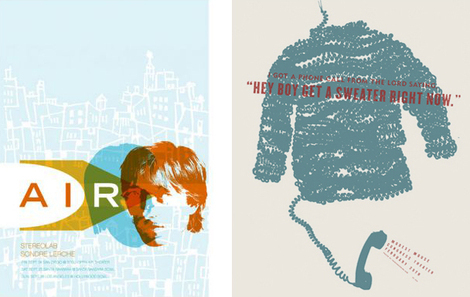 Each poster is based on a specific lyric, allowing fans to purchase posters referencing both the show they attended and their favorite song. The founding principle for their studio is "Do work we love for clients we admire". Simple, but perfect.